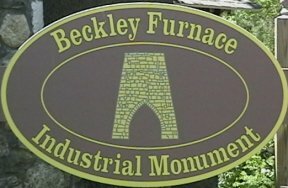 Are you planning on visiting Beckley Furnace, Connecticut’s Industrial Monument? We’re happy to provide you with driving instructions, as well as a convenient Google map. The historical site is located on Lower Road, in East Canaan, Litchfield County, CT, just off US Routes 44 and 7. To reach the furnace from the East, North, or West, take Route 44 to East Canaan, CT. Note the historic Canaan Congregational Church on the south side of the road. At the church, turn South onto Lower Road, passing alongside the Church building, and continue for approximately 1/2 mile, turning to the right and down the hill. The former furnace office — now, the Barnum & Richardson Building, our Educational and Study Center — and the furnace stack are visible on your left, with the pond and Blackberry River in the background. Alternatively, or if you’re coming from the South, take Route 7 to Canaan, CT. You’ll pass a railroad yard on your left, and just before you cross a bridge across the the Blackberry River, turn right into Lower Road, heading East. Beckley Furnace is about three miles east of the intersection of Lower Road and East Canaan. Parking is available at the furnace. Unfortunately, no public transportation is available to the Furnace. Bus service is available to Canaan, CT, around three miles away. The street address of the Office Building and the Furnace itself is 140 Lower Road, East Canaan, CT 06024 (if you prefer to navigate to it using other methods). The Beckley Furnace site is open during daylight hours 365 days per year. On Saturdays, from 10 AM – 2 PM during the summer months, and occasionally at other times, when pre-arranged, there are knowledgeable guides on hand to show you around and answer your questions about the iron industry of the Upper Housatonic Valley. Because the facility is staffed only during very limited hours, telephone contact is not available. If you have questions about the site or about programs we offer — or if you would like to schedule a visit by your school or other group — we suggest that you send an e-mail to info@beckleyfurnace.org well in advance of your visit.